Nui Bay is north of Loh Dalum Beach by about 1.5km and is just behind the large cliffs on the centre right as you look out to sea. 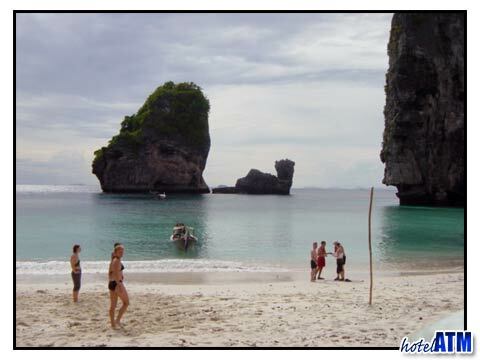 Loh Dalum is the popular north bay of the main Phi Phi Don Village and makes Nui Bay one of the 'beach-hopping' places to go, the other being Monkey Beach or Yung Gassem. Most of the tide, longtail boats and speedboats can drop you off on the sandy beach where you can enjoy an ideal setting. As you look out to sea you see the tall pillar cliff island (as seen from Loh Dalum bay) and the adjacent Camel Rock. The hump and the head are very obviously a Camel when you get along side it. Nui Bay is tidal and at low tide it is difficult to get on the sandy beach from a boat as the coral reef is shallow. Heading out to Nui Bay offers you some hours away from the pulse of the main Phi Phi Don village, a real get away beach where you can unwind. People take a snack and some water, there are no shops of any kind, and do some ‘quality-beach-time’. Nui Bay's snorkel reef is only 40 meters off shore and there is plenty to see in the way of colourful and shallow reef life. If you snorkel to the north of the beach you come to some more cliffs with massive overhangs and some caves. Under the overhangs you can find vast schools of juveniles schooling fish species which are simultaneously hunted by the long nosed Gar fish and herons alike. As you swim over the deeper seabed now 5-8 meters, you get to the tall cliff island and Camel rock. This has a deeper reef and 'wall' marine life ecosystem quite different to the shallower reefs. The west side these rocks has a depth of 15-22 meters and there are deeper pinnacles underwater out to sea. One of the best trips to Nui Bay involves kayaking from Loh Modee. This takes 20-25 minutes straight kayaking on a 2 man sit on kayak. The fun part is going under the huge walls just before Nui Bay. Kayaking also gives you a chance to explore the overhangs and blow holes just north of the beach. A blow hole is a torrent of water that shoots out of a hole in the mountain when the water gets compressed inside the cave. Put your kayak in line with the blow hole and it will knock you off your seat! You can hire kayaks from Loh Dalum Beach. The intricate Nui Bay and Camel Rock formations are beautiful features to explore as a snorkeler. When a body of water is hidden behind a rock you never quite know what you might find on the other side. This area os full of these obstructions and is an ideal place to snorkel around as you can often spot something quite big! On the drop off on the west you occasionally find some of the larger pelagic species. A whale shark was seen quite close in there in the 1998. North of Nui Bay the mountain is riddled with caves. Caves and the sea can be very dangerous so please treat them with respect. On a day when there are no waves it can be fun to explore the entrance of some of the cave structures. Nature can be very dramatic and beautiful place. The colour of the sand and light at the bottom of the sea is quite enchanting and unique. There are not many genuine Phi Phi sunsets as the mountains and cliffs block the sun on all the accommodation beaches. Nui Bay faces west and so gets a cracker depending on the exact time of the year. 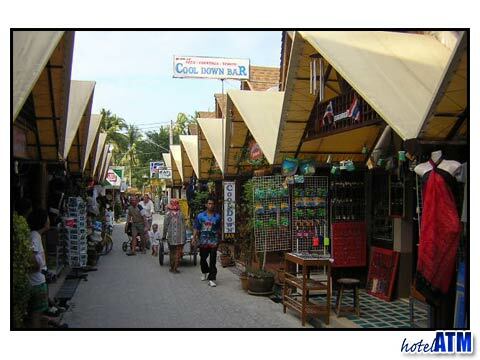 During the low season Phi Phi island weather comes on from the west. When the waves are up it is not possible to land here without some danger. The wave action is particularly disturbed as they bounce back off the cliff walls sending waves in every direction. There is a path from Lanah Bay that takes you over between the cliffs to Nui. It takes 10 minutes maximum. Lanah Bay is next to Loh Bagao and just 12 minutes from the Phi Phi Island Village Resort And Spa.